Product prices and availability are accurate as of 2019-04-14 12:10:24 BST and are subject to change. Any price and availability information displayed on http://www.amazon.co.uk/ at the time of purchase will apply to the purchase of this product. The second new no age statement release in quick succession following Talisker Storm in early 213. Port Ruighe (pronounced Portree, as in the largest town on the Isle of Skye), is finished in Port casks after initial maturation in American and European Oak refill casks as well as casks that have been deeply charred especially. 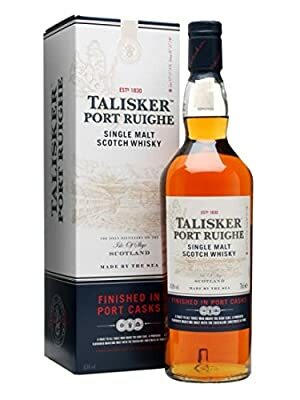 Alongside the distillery style there are similarities with Talisker Storm with the thicker, oilier mouthfeel and wood smoke. Port Ruighe has taken on additional characteristics from the Port casks however, adding sweetness and different notes such as plum and chocolate.